Santorini - Unit 18 Kallisti - Chakas Rock / Shakas Rock Accommodation. The most sought after and popular Santorini provides accommodation with an outdoor swimming pool and a tennis court. This unit is the place to be. Walking distance to the beach, with access to Thompson Bay and private beaches and well as Santorinis famous 'hole in the wall' rock feature. 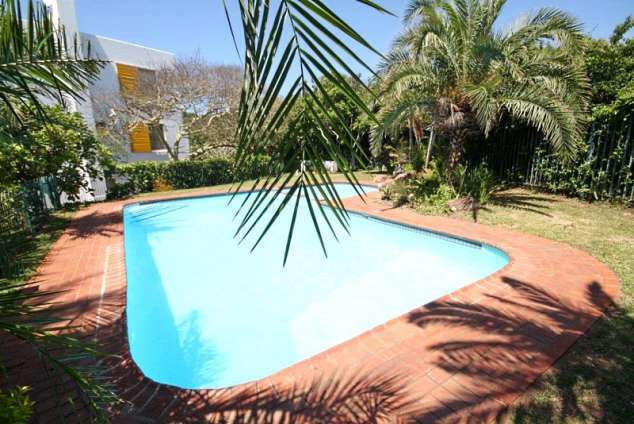 The Greek styled resort is close to Ballito Shopping Mall, Chakas fishing spot and Boulders fishing spot. The property features sea views as well as lush garden views. Guests are welcome to barbecue on their private balcony whilst admiring the ocean view or in the gardens with the river running by. Santorini - Unit 18 Kallisti is equipped with an indoor and outdoor seating area, a dinning area, a dish washing machine, kettle, hair dryer, fridge, oven, stove and a flat-screen TV with satellite channels. The 3 bedroom, 2 bathroom unit has a private en suite bathroom with a bath. The living room is fitted with air conditioning, the unit has a balcony, and we provide guests with a wardrobes and lock box. The accommodation offers a children's playground and a whale watching deck. Hiking is among the activities that guests can enjoy near Santorini. Ballito Junction and Lifestyle Centre is 2km away. Ndlondlo Reptile Park is 5 km from the resort, while Crocodile Creek is 7 km from the property. King Shaka International Airport is 15 km away. Detail description : Picnic or barbecue in the gardens, by the river or on your private balcony. Whale and dolphin viewing from the viewing deck. Swimming pool, tidal pool, private and public beaches. 732 page views since 16 Oct, 2018. Last updated on 28 Mar, 2019.